You have to do what you can, do the best with what you are. And you have to believe in wilderness. If you do that you can't go wrong. Arrival in Matachewan latest by 3 pm, catered supper, meeting, bed. Cars need to be shuttled. Paddle down Montreal River to Elk Lake, catered supper, meeting, bed. Cars need to be shuttled. Paddle to Latchford, catered supper. Cars need to be shuttled. Member of the Order of Canada as well as the Order of St. John. Nora Ryell wrote a great article about Kirk Wipper for The Globe and Mail, which was published on May 8, 2011. We can't describe better how and who Kirk Wipper was, therefore we quote from her article. “Kirk Wipper spent a lifetime contributing to environmental education. An early proponent of wilderness exploration, he literally paddled his way into the hearts and minds of a generation of canoeing and camping enthusiasts. Over a period of 45 years, his love for Canada was embodied in his collection of more than 500 canoes, most of which are now housed in the Canadian Canoe Museum. For Wipper, the canoe was not only a means of travel across the Canadian wilderness. 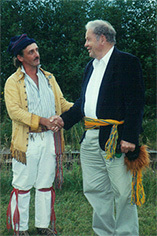 He felt it symbolized our heritage and the connection between the founding cultures of Canada. As Wipper reflected in a 1995 CBC Ideas program, "The canoe carried aboriginal people for thousands of years, followed then by the explorers and the missionaries and the engineers and the surveyors … until in modern times it gives us the gift of freedom. The canoe is a vehicle that carries you into pretty exciting places." 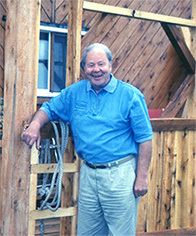 Kirk Wipper is the founder of the Canadian Canoe Museum in Peterborough, ON where most of his private collection are on display He was also the founder of Camp Kandalore in 1957. Kirk was a Professor at the University of Toronto, Kirk developed the syllabus for outdoor education courses in the 1970's, a program that is still required today as part of the BPHE undergraduate curriculum at U of T.
Kirk's heart was close to the "...Circle of All Nations, founded by long-time friend, Chief William Commanda, the Algonquin Elder from the Kitigan Zibi Reserve. Their friendship had begun when Wipper began to buy Commanda's birch bark canoes as part of his collection. The Circle consists of individuals committed to the environment, Canada's water resources, racial harmony and respect for indigenous wisdom. ..."
Tim McDonagh: "I wanted to know more about the Canadian Recreation Canoeing Association, therefore I took in this evening in Toronto. There was an individual talking at 7.15 p.m. called Kirk Wipper, speaking of the reenactment of the footsteps of the Voyageurs." After this gentleman's presentation his words were “There should be more expeditions like this”. Him not knowing that I have three newsletters in my pocket. There was a 10 minutes break. So I approached him and I handed him the three newsletters about my expeditions. He went aside and went through our newsletters and returned back on the stage where he wasn't really on the platform. And he gave us a plaque. We, the Iroquois Falls Canoe and Kayak Club off the beaten path, just letting you know there are more expeditions. And this was my great introduction to Kirk Wipper. We ended up being great friends as we go on many years after." Tim McDonagh: "Kirk was a speaker at mid morning. I was sitting down and all of a sudden, as the last speaker before lunch is speaking, I see Kirk stand up. He walks his way half way up the aisle and he points up to me and says, Tim, we're having lunch. You've got no choice when Kirk asks you, you got to go. But for him to pick me out of 800 people and say we're having lunch what can you say. Off we go to the Cafeteria and he asked me where do you want to sit. Well Kirk, let's go right to the back that way we won't get bothered by no one, I said. So we went to the back and as the Cafeteria filled with 800 people having their lunch. This was my opportunity to bring across to Kirk what I have thought through for a while. 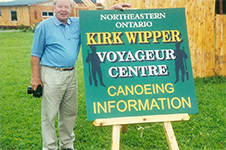 I said: Kirk, my friend, what are your thoughts if we named our center the Kirk Wipper Voyageur Center. Kirk looked at me he says I'm more than honored. So from that minute forward our land was to be called the Kirk Wipper Voyageur Centre. After 20 years of the Iroquois Falls Canoe and Kayak Club and our property being in the city of Timmins, there was no better time to change the name. So that's how our Kirk Wipper Voyageur Centre became reality." Have you read Lupo's blog about traveling with the West Wind Brigade? Click on Lupo's picture to find out more about that amazing dog that's traveling the world.